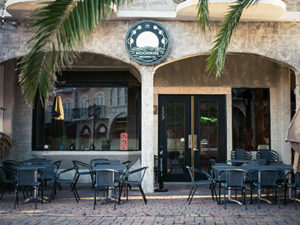 A brewing operation, bar, and tasting room located at the European Village, Moonrise Brewing Company is the first and only Brewery in Flagler County. With its local craft beer, Moonrise Brewing Company surely brings a unique experience to Palm Coast. Not only does Moonrise Brewing Company’s strength lie within their craft beer, they also serve a variety of complementary foods, creating a perfect combination between food and drink. And we must say, their Chefs Special never disappoints. Moonrise acts as the perfect atmosphere for socializing–social events such as Comedy Night and Live Trivia makes Moonrise the perfect space for food, drink, and fun.